The main venous vascular network of the pancreas consists of veins draining into the splenic vein and pancreaticoduodenal veins that drain the head of pancreas and adjacent second and thirds part of the duodenum. The postmortem venography studies of pancreas revealed however additional, more sophisticated pancreatic draining system consisting of: transverse pancreatic vein, dorsal pancreatic vein, splenic polar vein and caudal pancreatic veins, all draining body and tail of the gland[1,2] (Figure 1). Ongoing portal hypertension leads to formation of variable collateral channels. Common pathways of portosystemic shunting involve gastroesophageal, paraumbilical and splenorenal collateral vessels. Other rare anastomoses between the portal venous system and inferior vena cava (IVC), including retroperitoneal venous collaterals (veins of Retzius) also exist but are more difficult to depict sonographically. Sometimes in presence of portal hypertension only isolated collateral pathways such as pancreaticoduodenal channels can occur. A total of 11 patients were included in the study. The subjects were recruited between January 2004 and March 2008 among the patients admitted to Gastroenterology and Pathology Department of Pomeranian Medical University in Szczecin for any reason. Oral informed consent was obtained from all subjects as well as the Heads of Departments. We retrospectively reviewed clinical records, gray-scale and color Doppler examinations of all the patients with clinically proven portal hypertension of any origin. Patients with malignant disease were excluded from the study. Among the analyzed group with portal hypertension, we finally selected patients with incidental findings on gray-scale and Doppler US records suggestive of pancreatic varices. To avoid inter observer variations, all the examinations were performed by the same operator (A.S) with 20 years of experience in sonography. Data collected included: varices size (largest dimension), location, echogenicity (with reference to the inferior vena cava) and margins. The vascularity of the lesions was evaluated by means of color Doppler, power Doppler and pulsed Doppler sonography. 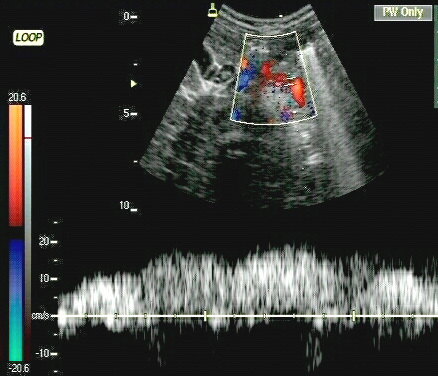 The ultrasound scanners used were: Pico (Medison, Seul, Korea) equipped with 5 MHz convex transducer (color Doppler frequency range 1 - 12,5 kHz) and 7,5 MHz linear transducer (color Doppler frequency range 0,6 - 12 kHz) ; SSDα 10 (Aloka, Tokyo, Japan) equipped with 2,5 MHz transducer (power Doppler frequency range 0,2 - 13 kHz and color Doppler frequency range 0,2 - 6,5 kHz). With the patient lying in the supine position, the widened veins of pancreas were visualized in the longitudinal and transverse planes. All CT examinations were performed on a MDCT scanner (Somatom Sensation Cardiac 64, Siemens Medical Solutions), whereas all upper gastrointestinal endoscopy examinations were performed with either CF-Q165L or CF-Q160ZL Olympus endoscopes, both equipped with Olympus EXERA CV-160 video set. The group enrolled 11 patients (6 women and 5 men) aged 6 - 75 years (mean age of 53 years). Of the 11 subjects with sonographically detected pancreatic lesions, 9 underwent CT examinations and 11 had upper gastrointestinal endoscopy conducted. In the remaining 2 patients no other (except for sonography) confirmatory diagnostic procedures were performed. 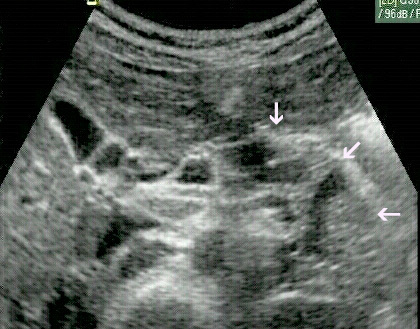 Varices of pancreas appeared on gray-scale sonography either as anechoic, well-defined oval lesions or tortuous tubular structures located in different parts of pancreas. The diameter of dilated pancreatic veins ranged from 5 - 24 mm (a mean diameter of 9 mm). In all of 8 patients with prehepatic portal hypertension, obstruction of the portal vein was present. Two subjects had simultaneous splenic vein occlusion and in 2 other subjects complete stenosis of the superior mesenteric vein was detected. The most common cause of these changes was chronic pancreatitis (n = 3). Other reasons included: prolonged to 4 weeks jaundice of the newborn, type B hepatitis (n = 1), postgastrectomy intra-abdominal abscess (n = 1), intestinal necrosis with subsequent resection (n = 1) and myeloproliferative syndrome (n = 1). Intrahepatic portal hypertension was present in 3 patients with cirrhosis resulting from alcohol abuse (n = 1), type B hepatitis (n = 1) or autoimmunologic inflammation (n = 1). Among the 11 patients 3 had varices located in the superior part of the pancreatic head, body and tail of the gland (Figure 1a, 1b, 1c). In 6 subjects dilated veins were found in the body and tail of the pancreas (Figure 2,3). In the remaining 2 patients one had varices located in the body and superior part of the pancreatic head (Figure 4) and the other in the head of the gland (Figure 5). In all cases the character of blood flow was assessed by means of pulsed Doppler (Figure 6). Cavernous transformation of the portal vein was noted in 2 cases. In all of the subjects alterations in echogenicity of the pancreas were present. 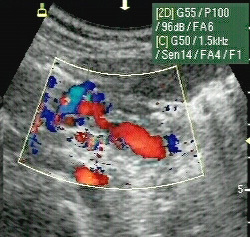 The sonographical findings varied from those seen in chronic pancreatitis to non-specific changes including poor-definition of the gland and atrophy of the pancreatic parenchyma (Figure 7 and 8). 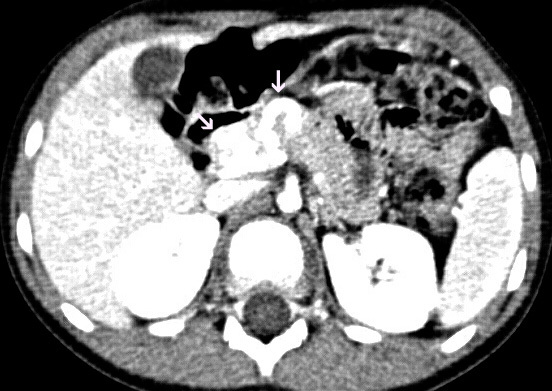 Pancreatic varices were confirmed on CT scans in 9 cases and in 3 of these patients CT provided additional information concerning portal circulation (Figure 9 and 10). In 2 of those subjects splenorenal shunt was present and in 1 patient obstruction of the middle part of the superior mesenteric vein was revealed. Of the 11 patients with upper gastrointestinal endoscopy performed, 8 had esophageal varices confirmed. In 1 patient varices of esophagus coexisted with varices of the gastric fundus (Figure 11). One patient had only ulceration at the duodenal bulbus detected and in 1 subject no pathological findings were visualized The 11 reported cases of pancreatic varices are summarized in Table 1. The accuracy of US in pancreatic visualization remains unsettled as it is plagued by patient related factors (gas overlying in the large bowel, body habitus, etc.). Therefore since 1980’s, despite patient’s exposure to both radiation and contrast media, CT has become more preferable technique in pancreatic imaging. In the beginning CT images were not readable enough to replace conventional angiography in assessment of pancreatic vascularization. This however changed rapidly with the introduction of spiral (helical) CT, a technique that gave improved diagnostic capabilities including 3D imaging and CT angiography. As a result, the quality of CT images of portal venous system collaterals became almost equivalent to that obtained by DSA. The achieved progress was originally used in evaluation of venous infiltration by neoplasms[5-7]. No other imaging techniques including MR were considered of greater accuracy in that matter, except for intraportal endovascular ultrasonography which proved to have advantage over CT and even angiography. This diagnostic technique however was never widely accepted[8-14]. Varices of pancreas are a rare manifestation of portal hypertension. The venous vascular network of the gland is complicated with variable existing patterns. Figure 1 illustrates the most common variant of the pancreatic draining system. The transverse pancreatic vein can drain into the inferior mesenteric vein, superior mesenteric vein, and splenic vein or even into the colic vein. In some cases veins of the body of pancreas drain into the left gastric vein. Hypoplasia or agenesia of the dorsal or transverse pancreatic vein can also occur[1,2]. Therefore the appearance of pancreatic collateral system would vary from the anatomical variations and presence of portosystemic shunts. Finally, the collateral circulation would depend on localization of the obstruction in the portal venous system, the coexistence of thrombosis and degree of stenosis of other portal tributaries. Our study shows that pancreatic varices can occur in several types of portal hypertension. To our knowledge, not many reports focus on this issue. Cho et al. described widened pancreaticoduodenal veins as a rare example of collateral pathways in portal hypertension. Duodenal varices make up 1 - 3% of all varices in patients of portal hypertension[15-19]. These varices are usually found in the deeper layer of the duodenal wall and are hardly visible endoscopically. Therefore their propensity to bleed is low. In our study, only 1 patient had varices located in the pancreatic head. In 4 other cases dilated collateral veins of the superior part of the pancreatic head were communicating with similar channels in the body and tail of the gland. These findings would confirm other observations indicating duodenal bulb as the most common site of varices[15-19]. In the remaining 6 cases varices were detected only in the body and tail of the pancreas. Differential diagnosis of pancreatic varices should include secondary arteriovenous malformation (AVM) and cystic lesions associated with intraductal papillary mucinous neoplasms[20-23]. In our case both diagnoses were ruled out by means of pulsed Doppler imaging. Table 1: Summary of clinical records and Sonographic appearances in 11 patients with pancreatic varices. Our study has some limitations. First, none of the lesions had it’s vascularity in conventional angiography assessed. It seems however that exploitation of the pulsed Doppler sonography in all of the 11 patients and CT in 9 of the 11 cases provides enough information to prove the presence of varices within the pancreas. Second, our study was a single-center study and independent, external evaluation in other cohorts is necessary. In conclusion, we believe that sonography can provide diagnostic signs suggestive of varices of pancreas in every part of the gland. Other abnormalities however, such as AVM and cystic lesions should be also taken in consideration. 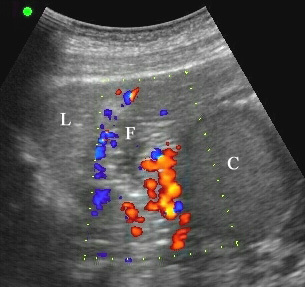 Furthermore, when pancreatic varices are detected, thoroughly ultrasonographic assessment of both liver and portal system should be performed. 1. Reinchardt, W., Cameron, R. Anatomy of the pancreatic veins. A post mortem and clinical phlebographic investigation. (1980) Acta Radiol Diagn (Stockh) 21(1): 33-41. 2. Keller, F.S., Niles, N.R., Rösch, J., et al. 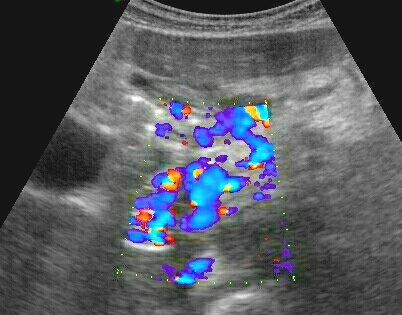 Retrograde pancreatic venography: autopsy study. (1980) Radiology 135(2): 285-293. 3. Ibukuro, K., Tsukiyama, T., Mori, K., et al. Veins of Retzius at CT during arterial portography: anatomy and clinical importance. (1998) Radiology 209(3): 793-800. 4. McCain, A.H., Bernardino, M.E., Sones, P.J., et al. Varices from portal hypertension: correlation of CT and angiography. (1985) Radiology 154(1): 63-69. 5. Crabo, L.G., Conley, D.M., Graney, D.O., et al. Venous anatomy of the pancreatic head: normal CT appearance in cadavers and patients. (1993) AJR Am J Roentgenol 160(5): 1039-1045. 6. Cho, K.C., Patel, Y.D., Wachsberg, R.H., et al. Varices in portal hypertension: evaluation with CT. (1995) Radiographics 15: 609. 7. Ibukuro, K., Tsukiyama, T., Mori, K., et al. Peripancreatic veins on thin-section (3 mm) helical CT. (1996) AJR Am J Roentgenol 167(4): 1003-1008. 8. Finn, J.P., Kane, R.A., Edelman, R.R., et al. 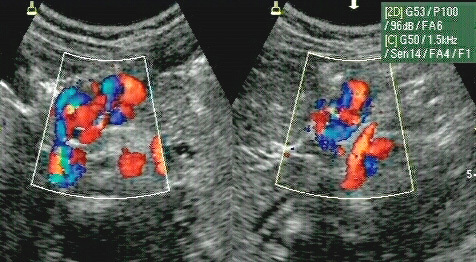 Imaging of the portal venous system in patient with cirrhosis: MR angiography vs Duplex Doppler Sonography. (1993) AJR Am J Roentgenol 161(5): 989-994. 9. Ito, K., Blasbalg, R., Hussain, S.M., et al. Portal vein and its tributaries: evaluation with thin-section three-dimensional contrast-enhanced dynamic fat-suppressed MR Imaging. (2000) Radiology 215(2): 381-386. 10. Mori, H., Miyake, H., Aikawa, H., et al. 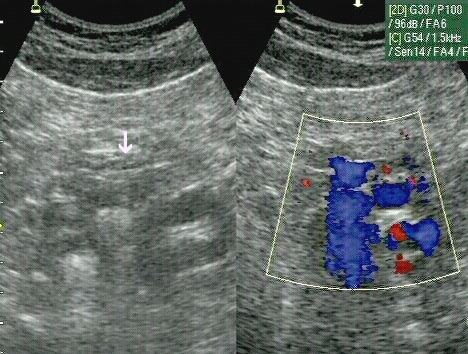 Dilated posterior superior pancreaticoduodenal vein: recognition with CT and clinical significance in patients with pancreaticobiliary carcinomas. (1991) Radiology 181:793. 11. Hommeyer, S.C., Freeny, P.C., Crabo, L.G. Carcinoma of the head of the pancreas: evaluation of the pancreaticoduodenal veins with dynamic CT- potential for improved accurancy in staging. (1995) Radiology 196(1): 233-238. 12. Vedantham, S., Lu, D.S., Reber, H.A., et al. Small pripancreatic veins: improved assessment in pancreatic cancer patients using thin-section pancreatic phase helical CT. (1998) AJR Am J Roentgenol 170(2): 377-383. 13. Yamada, Y., Mori, H., Kiyosue, H., et al. 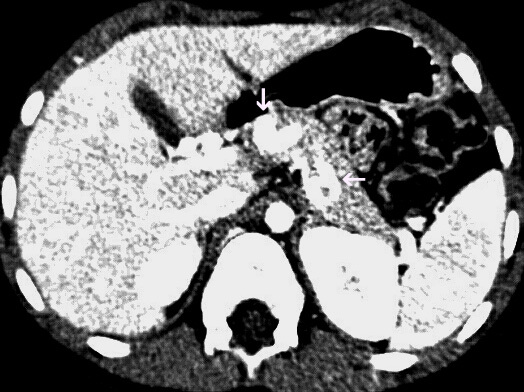 CT assessment of the inferior peripancreatic veins: clinical significance. (2000) AJR Am J Roentgenol 174(3): 677-684. 14. Kaneko, T., Nakao, A., Inoue, S., et al. Portal venous invasion by pancreatobiliary carcinoma: diagnosis with intraportal endovascular US. (1994) Radiology 192: 681. 15. Amin, R., Alexis, R., Korzis, J. Fatal ruptured duodenal varix: a case report and review of literature. (1985) Am J Gastroenterol 80(1): 13-18. 16. Hashizume, M., Tanoue, K., Ohta, M., et al. Vascular anatomy of duodenal varices: angiographic and histopathological assessments. (1993) Am J Gastroentorol 88(11): 1942-1945. 17. Dagenais, M., Pomier-Layrargues, G., Dufresne, M.P., et al. Transhepatic portal vein stenting for treatment of ruptured duodenopancreatic varices in a patients with chronic pancreatitis. (1994) Surgery 115(6): 669-673. 19. Philips, C.A., Arora, A., Shetty, R., et al. A Comprehensive Review of Portosystemic Collaterals in Cirrhosis: Historical Aspects, Anatomy, and Classifications. (2016) Int J Hepatol 2016: 6170243. 20. Kurosaki, M., Hattori, K., Minato, Y., et al. Asymptomatic arteriovenous malformation of the pancreas. Demonstration by Doppler ultrasonography and magnetic resonance imaging. (1993) Dig Dis Sci 38(7): 1342-1346. 21. Shahrudin, M.D., Noori, M.S. Management of rare case of arteriovenous malformation of the head of the pancreas. (1997) Hepatogastroenterology 44(13): 284-287. 22. Yamamoto, T., Takeuchi, K., Honjo, H., et al. 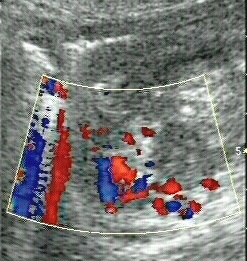 Pancreatic arteriovenous malformation presenting as cysts: Doppler sonographic diagnosis. 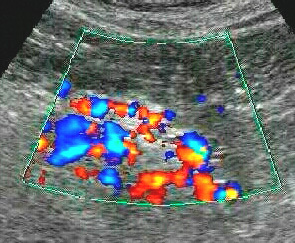 (2000) J Clin Ultrasound 28(7): 365-367. 23. Takemoto I, Tsuda M, Yano Y, et al. 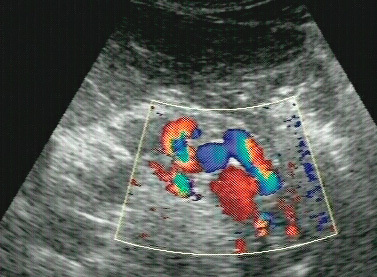 Pancreatic arteriovenous malformation combined with portal thrombosis. (DOI: 10.2169/internalmedicine.46.1852).